For more than eighty years homemakers have been dealing with the problem of removing Kool Aid stains from clothing. Kool Aid stains are one of the most difficult types of stains to remove. This is especially true of stains made from red Kool Aid. However, there are several different cleaning methods and techniques that are generally successful in removing stubborn Kool Aid stains. Before using any of the following methods or cleaning tips, always test the cleaning method on a small hidden area of the item being cleaned. By doing this you make sure the cleaning technique does not damage the material or the color of the item. 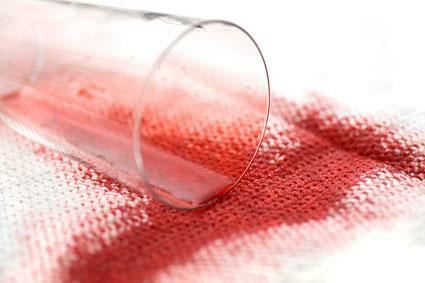 The Borax method works best on fresh Kool Aid stains which are lifted out of the fabric. Blot the excess liquid from the garment using a clean white cloth starting at the outer edge of the stain and moving inward. Be careful not to rub the stain further into the fabric. Spray the stained area with ice water and then cover it with borax. Gently rub the borax into the stain using a toothbrush. Using a clean cloth, blot the stained area. Launder the item in cold water and detergent. Allow the garment to air dry. The boiling water method works on fresh Kool Aid stains. Center the stained area of the item over a large bowl. Pour boiling water over the stain being very careful not to splash the water onto yourself. Always make certain to air dry the garment after removing the Kool Aid stain. Placing the clothing in a drier will set in any stain that has not been completely removed. On some garments a light stain may not be noticed until the item has completely dried. If there is any remaining stain repeat the cleaning process. Never try to remove a Kool Aid stain from an item that is dry clean only. Bring the stained garment to a dry cleaner as soon as possible. Whichever method you choose for removing Kool Aid stains from clothing, always be certain to do a test application of the technique on a small hidden area to make sure the process will not do further damage the area.